That sounds great, right? Black lights, panels and funnels leading into a bucket of alcohol fumes… just set it outside and collect in the morning. This photo only shows about 1/3 of the pile, though. From one trap. Let’s go in for a close up. 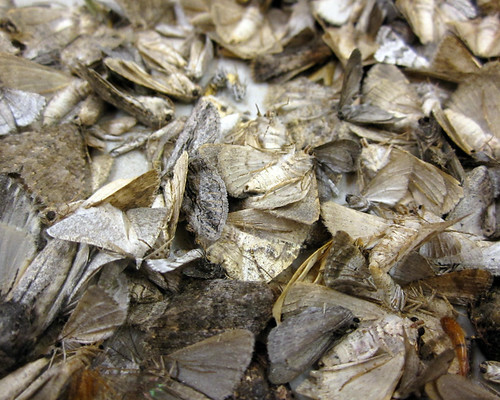 If you have never reached your hand into a pile of moths… it is surreal. They are so soft and slippery, it is a very discomforting sensation. And did I mention sometimes they are not sufficiently dead and start fluttering around? It was strange. So, yes, now you have your moths and need to sort them. 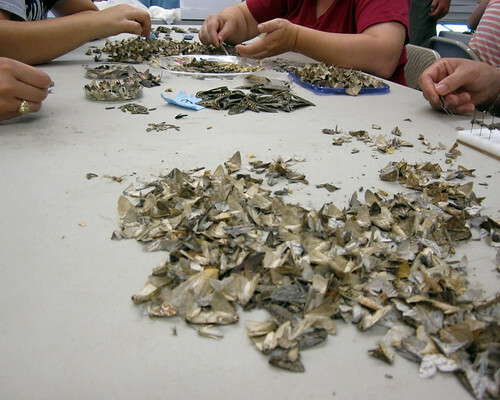 That was one of our exercises at the Lep Course: trying to sort big piles of moths to family level. It is a task a few of the instructors performed every day, but as a class we only spent one long morning sorting. I think it would have been fun to do a sort at the start of the week and again at the end, to see how we improved! We mostly found noctuids, geos, sphingids, notodontids, and various microlep families. We sorted them into piles, and divided out some of the species we recognized. There was one noctuid genus in particular, Matigramma, which dominated the catch. 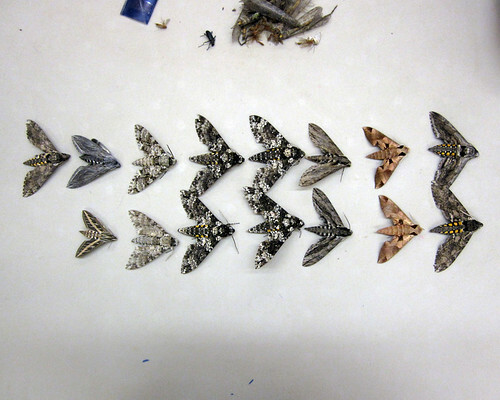 The easiest to sort were the sphingids, which look more like fighter airplanes than insects. And here I am, hard at work. My allergies were terrible that week, so I wore my glasses most of the time. I don’t think I would get into ecology simply for the sheer number of specimens I would have to work with. I love sorting and pinning, but I have other things to do, too. I did an ecological study as an undergrad, about beetles in the canopy and understory of Quebec forests. 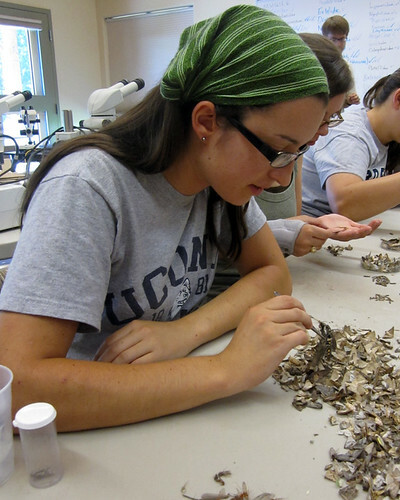 I sorted almost 10,000 specimens to family, and a few thousand of those to species. I hope to get that work published eventually. But yeah, I got a taste of that world, I wouldn’t want to do that for a few years solid! Of course, raising caterpillars isn’t exactly easy. Have to pick my battles. Posted on September 17, 2011, in Arizona Lep Course, Invertebrates, Lepidoptera. Bookmark the permalink. Leave a comment.